Good morning…some minor alterations to a cold front location will determine the severe weather threats later today…especially from a location standpoint of where the storms form. There is also a strong cap in place which has been expected. More on what this is in the discussion part of the blog. Parts of the area will likely be put under a severe thunderstorm watch later today…so expect to hear your weather radio go off sometime later this afternoon or perhaps you’ll get a notification on your phone. Some areas maybe placed under severe thunderstorm warnings early this evening as well. Hail and gusty winds are the main threats from this scenario. Today: Cloudy skies with breaks showing up later on in the afternoon. Odds favor these breaks happening after 3-5 PM or so. Warm and humid with highs 75-80°. Breezy as well. 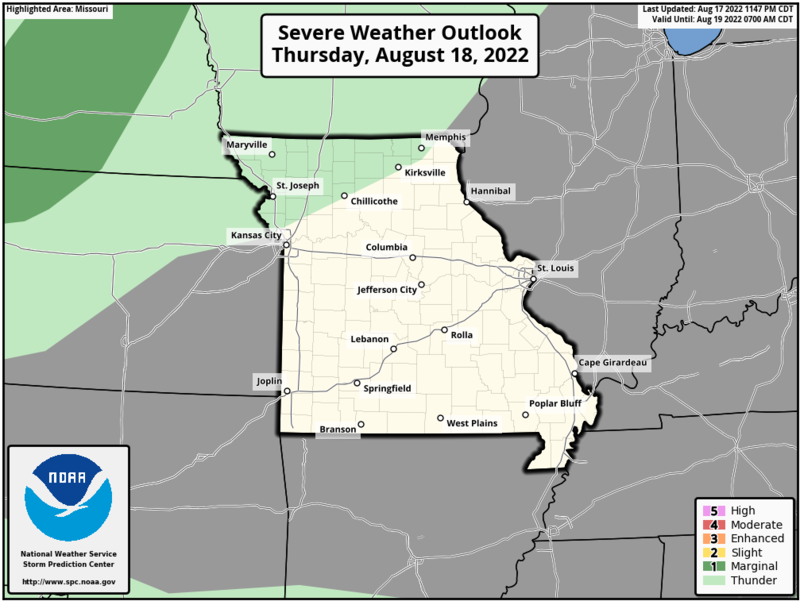 Tonight: Storm are likely from KC southwards. Some of the storm may be severe with gusty winds and some hail. Some localized flooding is possible as well. Tomorrow: Partly cloudy with a few scattered showers possible in the afternoon. Highs will be cooler with temperatures 55-60°. Blustery would be a good word for tomorrow with a pretty decent north wind blowing too. Friday: Nicer with near average highs in the 60-65° range. So some updates are needed as is typically the case with these situations. there is a rather stout cap in place. This is roughly up at 10,000 feet in the atmosphere and nothing is going to happen till that breaks (assuming it breaks). IF it does break it won’t be till around 5-7PM or so. The cap is sort of like a “lid” to the ability of convection to get going. It represents a layer of “warmer” air that doesn’t allow the air below it to rise through the cap. Again it’s like putting a lid on a boiling pot of water. The lid keeps the steam from rising. There are questions about when exactly the cap breaks down to allow storms to fire. This is important because while we are capped through the middle of the afternoon a cold front will be coming towards the area. No front…no storms. The front though will make it to us. An issue is will it arrive before the cap breaks and push through before the cap can break. IF that happens then whatever activity we get will be post frontal and that usually is more rain than anything else…at least locally. 3) Everything is going to happen VERY close to KC…around 6-8PM or so an then quickly drop towards the south and southeast. For KC it will be a rainy evening. The point of that sentence is that this window for severe weather is VERY short. 4) The SPC has shifted the risk categories towards the SE…the KC Metro is barely in this now. Areas to the south, which is the area that I was thinking about all along will be the most vulnerable. Areas more south of I-70 and towards and south of US 50…from roughly Paola eastwards through Warrensburg and out towards 65 highway from Marshall to Sedalia may see the strongest of storms. 5) Some areas may get some localized flooding from this. While the heaviest part of the storms will be moving along…there should be some decent rains behind the storms as well and with the general storm movement being towards the SE and the individual storms moving towards the NE…some training is possible. 6) IF this plays out…very possible that many areas north of KC won’t see anything aside from rain really while areas south of I-70 get the bigger rumbles of thunder and perhaps some of the hail as well. Again this is all a VERY delicate matter of timing and when/where the cap breaks. 8) Let’s add in the HRRR model…remember this model loves it’s convection. What’s important though is to look and see when and where it pops the convection. This morning the runs were essentially popping this near and east of I-35. Again a 50 mile wild adjustment one way or the other either sends the worst of the storms out of the Metro or puts the heavier storms right in the Metro. This model will update throughout the day for you. When the model is updating you will get a message that the model is updating. For timing purposes…21Z is 4PM…0Z is 7PM…03Z is 10PM and 06Z is 1AM tomorrow. Overall the higher risks of more concentrated and volatile weather will be more towards OK/TX. That is more located where a stronger wave is going through. 9) Since many of you are weather “savvy”…hey you’re reading a weather blog…pass this information along to others who may not be as “savvy”. There has been some research done in the southern part of the country that I talked about on FB yesterday. 10) For the KC region the severe threat ends by 9PM or so…maybe even earlier than that based on the front’s movement. We’ll have updates on FOX 4 KC as the day moves along and I’ll see you tonight at 5/6/9/10. Our feature photo comes from ‎Trudi Burton‎ . She took it last night…look carefully. See the plane?